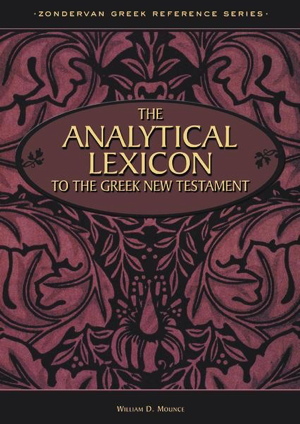 You can purchase The Analytical Lexicon to the Greek New Testament ​​​ online from ChristianBook.com or from your local bookstore. Based on the UBS 3d edition (revised). Most significantly, The Analytical Lexicon to the Greek New Testament is keyed to the author's Morphology of Biblical Greek, which explains in detail why some Greek words follow certain patterns and other Greek words follow seemingly very different patterns. The Analytical Lexicon to the Greek New Testament is more than a tool for quick reference -- it provides the Greek student or scholar with an index to another body of literature.